Mind mapping is a beneficial activity when conducted in a business setting. As a problem-solving tool, it has the added benefit of assisting team building and small group bonding. Work morale can be enhanced and projects completed more quickly when mind maps are incorporated into creative thinking. It is one way to provide a loosely structured, yet targeted method for approaching project development. Mind maps use a blend of words with visuals/graphics, and there is ample room for creative input from participants. They can condense a large amount of material into a format that is both concise and easy to remember. Some exciting and useful software has been created to facilitate mind mapping activities. 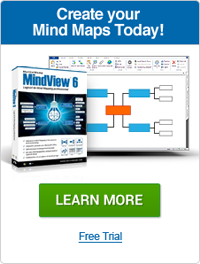 MatchWare's MindView is an incredibly powerful mind mapping software. Using software for mind maps improves learning and increases study efficiency over traditional note taking . It is an excellent way to show graphically complex relationships that may exist between ideas and information. Mind maps are a truly unique way to bring creative challenge to employees. They are more likely to think outside-the-box as they are able to approach a keyword or idea from every angle. The visual impact of mind mapping also reinforces and boosts retention of the mind map content.